Gathering My Roses: Pillsbury® Grands!® Mini Biscuits Review & Giveaway, CLOSED! Pillsbury® Grands!® Mini Biscuits Review & Giveaway, CLOSED! If you´re looking for homemade taste but don´t have the homemade time, then look no further than Pillsbury® Grands!® Mini Biscuits, the new freezer-to-oven biscuits that come warm, fluffy and fresh from your oven in just minutes. Bring the mouthwatering aroma of fresh-baked biscuits to your kitchen when you serve up Pillsbury® Grands!® Mini Biscuits! I love using the new Pillsbury® Grands!® Mini Biscuits in recipes, both savory and sweet. This recipe is a quick and easy Peach Cobbler that Liz and I have made before -- with a few minor, tastier adjustments! Drain liquid from Peaces and reserve for later. Place peaches and cranberries in a large bowl. In a separate bowl, mix sugars, cinnamon, and nutmeg. When mixed well, add to peaches / cranberries. Mix thoroughly to coat the fruit. Place in a 9 X 9 casserole baking dish. Pour approx. 1/3 of the liquid from the peaches over the mixture. In a bowl, mix 1 cup of sugar, 1 tsp. cinnamon together. Stir well. Dip each biscuit into the mixture and coat well. Place the biscuits on top of the peach mixture until the top is covered. Bake at 375 Degrees until the biscuits are done. Trust me -- it's yummy! 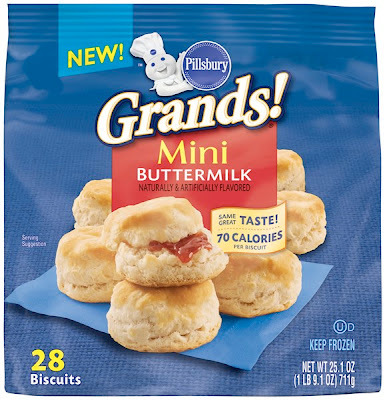 Pillsbury® would love to know how YOU will use their new Pillsbury® Grands!® Mini Biscuits and so would I! I am always on the lookout for new recipes. Pillsbury® is offering our readers a $1 OFF COUPON -- just click the link! 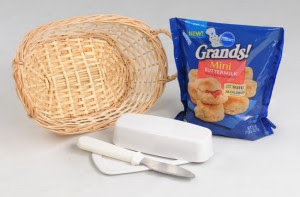 The Lucky Winner will receive a Pillsbury® Grands!® Mini Biscuits prize pack which includes a VIP coupon good for a free package of biscuits, a $15 gift card to purchase your recipe creation / experimentation needs, a biscuit basket, a butter dish and spreader! Ready to turn on your creative side? Just follow the entry directions below for your chance to enter and win! Post your favorite recipe using Pillsbury® Grands!® Mini Biscuits or Pillsbury® Grands! Biscuits. The recipe may be sweet or savory! This contest will be open from Thursday, October 7th until Friday, October 15th. Winner will be announced on Saturday, October 16th. The prize packs and information were provided to us by Pillsbury through MyBlogSpark for the purpose of review. We were under no obligation to review this item. We received no monetary compensation. The opinions expressed in this review are our own and based on our own personal use of the item. My favorite recipe is to create chicken and biscuits with gravy. Make gravy of your choice, cook chicken and season well with marinade (we love it spicy), cook biscuits and pour over. Have for breakfast, lunch, or dinner. Can be done with sausage, too! What a generous giveaway! My favorite biscuit recipe is cooking up some low sodium bacon (2 slices), scramble 1 egg, sprinkle a little reduced fat chedder shredded cheese and put it all in between some fresh, hot biscuits for a breakfast sandwhich! It's very easy to make and delicious! My favorite recipe with these is serving them with country gravy and sausage. I like to cut them in half and put strawberry and whipped heavy cream over the biscuits I found it off the Pillsbury site and use different fruit depending on the season. i like the biscuits with a hotdog wrapped inside them- oh soo good. fan of Gathering My Roses on Facebook. I like to split the biscuits in half. Sprinkle with cheese. Put back together, sprinkle fresh rosemary and ground black pepper on top. Bake as normal. There are a few recipes similar to the Holiday Appetizer Wreath in the Pillsbury recipes that I have made. A precooked pork breakfast link and a cube of cheddar cheese in the center of biscuit dough is my favorite simple recipe. I like to cut them in half and put pan sausage and grape jelly on it. I'd have to say biscuits and gravy or pizza. Use a muffin pan and add a raw biscuit in each cup, shape it like the muffin cup. Brown 1 pound of ground beef and add 1/2 cup BBQ sauce. Spoon this on top of the raw biscuits and add shredded cheese ontop. Bake 350 for 15 minutes. The savory mini-scones are my favorite! I think they would make great lil breakfast sandwiches or shredded pork sliders but would probably love them with just butter & honey. Yum! I cut the biscuits in half and have sausage and gravy over them. 1 can Pillsbury® Grands! Biscuits. Flatten your biscuits, coat tops with sauce and then add pepperoni and cheddar. Bake until toasted. Cook sausage until done. Add butter and flour. Simmer for a few minutes on medium heat stirring frequently. Add milk, salt and pepper. Simmer over medium-high heat stirring constantly until desired thickness. We like to put beef stew in an iron skillet and top with the biscuits. Bake in the oven until biscuits are cooked through. Follow Pillsbury Treats on Twitter. I like using them to make bacon and egg sandwiches! I love to make sausage gravy and serve on top of biscuits. When we have ham a couple times a year I make a ton of ham gravy and freeze it for breakfasts too. Yum! I "Like" Pillsbury on Facebook. We love to have biscuits with sausage gravy over top of them! My favorite recipe is baking the biscuits and making them into little pizzas by adding tomato sauce, pepperoni and any other topping I feel like. # Heat oven to 375°F. Place frozen biscuits on ungreased cookie sheet, sides touching. Bake at 375°F. for 10 minutes. # 2Remove partially baked biscuits from oven. Top biscuits with bacon and cheese. Return to oven; bake an additional 10 to 14 minutes or until golden brown. Serve warm. The Cinnamon Pull Apart Bread is a lot like Monkey Bread, but with the biscuits rather than frozen bread dough. Sounds great! 1Heat oven to 350°F. Lightly grease 12-cup fluted tube cake pan.2In large plastic food-storage bag, mix granulated sugar and cinnamon. Separate dough into a total of 16 biscuits; cut each into quarters. Shake in bag to coat. Arrange in pan. Mix brown sugar and butter; pour over biscuit pieces.3Bake 28 to 32 minutes or until golden brown and no longer doughy in center. Cool in pan 10 minutes. Turn upside down onto serving plate; pull apart to serve. Serve warm. My favorite on Grands! is white sausage gravy to go with a chicken dinner. I've never tried mini grands! That's really cute. I'll have to look for them, since sometimes you don't want to eat biscuits until you burst. We keep it simple.. we just love to make biscuits & gravy with sausage! I like to have cube steak marinated in Italian Dressing and then cooked and put on a biscuit for breakfast. I like to make eggs and bacon sandwiches. We like to make pigs in a blanket - flatten a biscuit, roll up a little hotdog inside it, then bake until golden. I love to make little mini pot pies with biscuits on top! I like mine plain with butter and honey. I take the Grands, sausage, eggs, and cheese, make to freeze for mornings with no time. I put BBQ shredded pork with onions and parmesan cheese in between the biscuits to make sliders. I Follow Pillsbury on Facebook. Bake biscuits. Cool slightly, cut in half. Cover with butter or ICBINB, then add a generous spoonful of Welch's grape jelly. Eat. looks so good and SO easy! Just the kind of recipe I need for the holidays! I use them to make chicken n dumplings. You need chicken broth, heavy cream and the biscuits. * 1In medium saucepan, heat soup just to boiling over medium-high heat. * 2Meanwhile, place frozen biscuits on microwaveable plate. Microwave on High 15 to 30 seconds or just until biscuits begin to thaw. Cut each biscuit into 6 pieces. * 3Place biscuit pieces on top of simmering soup. Reduce heat to low; cover and simmer 6 to 7 minutes or until dumplings are fluffy and no longer doughy in center. I make the biscuits and use them for Chicken and Dumplings. YUM. I ahve to say - I prefer them just themselves with butter! I entered the contest for the blender bottle as well. These would make great mini breakfast sandwiches with a sausage or Canadian Bacon patty, a bit of fried egg, and some cheese. This is hardly a recipe but it's the way I love to eat biscuits. I make homemade sausage gravy and pour it over baked Pillsbury Biscuits. Delicious breakfast! My favorite recpie is to make a big pot of sausage gravy and smother my buiscits!! My kids love to break each roll in half (any type as long as it is one of the pillsbury) dip them in butter, cinnamon and sugar, toss them in a baking dish and cook for 10-12 minutes. Perfect sweet rolls with minimum fuss and a great taste!! Kid friendly too - thanks pillsbury! 1Heat oven to 375°F. In 10-inch skillet, cook beef over medium heat, stirring frequently, until thoroughly cooked; drain. Stir in barbecue sauce; cook 1 to 2 minutes, stirring occasionally, until hot. Stir in cheese.2If using crescent rolls: Unroll dough; separate into 4 rectangles. Press each into 8x4-inch rectangle, firmly pressing perforations to seal. If using dough sheet: Unroll dough; cut into 4 rectangles. Press each into 8x4-inch rectangle. Cut each in half crosswise, making 8 squares.3Place about 2 rounded tablespoons beef mixture on center of each square. Fold dough over filling, forming triangles; press edges with fork to seal. With knife, cut small slits in tops for steam to escape. Place on ungreased cookie sheet. Brush with egg; sprinkle with sesame seed.4Bake 11 to 18 minutes or until golden brown. Immediately remove from cookie sheet. Serve warm. It's nothing fancy but we like to use the biscuits to make mini breakfast sandwiches with egg, bacon, and cheese. I like the Monkey Bread and Empanada recipes on the Pillsbury site. Great way to use biscuits! * 1Heat oven to 350°F. In ungreased 13x9-inch (3-quart) glass baking dish, melt butter in oven. Tilt pan to coat inside with butter. * 2Sprinkle brown sugar over butter. Arrange pineapple slices in dish. Fill centers of pineapple with cherries and spaces between with coconut and nuts. Bake 7 to 9 minutes or until pineapple is hot. * 3Separate dough into 8 biscuits. Top each pineapple slice with 1 biscuit. Brush tops of biscuits with reserved pineapple juice. Sprinkle with granulated sugar. * 4Bake 25 to 30 minutes or until biscuits are deep golden brown and no longer doughy in center. Immediately place heatproof serving platter upside down over baking dish; turn platter and dish over. Remove baking dish. Spread any topping remaining in dish over biscuits. Cool 15 minutes before serving. * 1Heat oven to 375°F. Line cookie sheet with parchment paper, or spray with CRISCO® Original No-Stick Cooking Spray. Separate dough into 5 biscuits. Split each biscuit to make 10 rounds. Press out each biscuit half to form 3-inch round. * 2Sprinkle each biscuit round with cheese to within 1/2 inch of edge. Top each with meatball. Bring up sides of dough over meatball; pinch edges to seal. Brush rounded tops and sides of dough with butter; coat with croutons. Place, seam side down, on cookie sheet. * 3Bake 10 to 15 minutes or until golden brown. * 4Place appetizer pick in each biscuit-wrapped meatball to form meatball pop. Serve with warm pasta sauce for dipping. Pillsbury Twitter follower as jennem1. I like their Strawberry Biscuit Shortcakes recipe. Thanks for the giveaway. My favorite easy recipe is to enjoy them with fresh raspberries and cool whip. Thank you for the lovely giveaway. We love eating our Pillsbury Grands with sausage gravy over the top! Mix soup and milk, stir in thawed broccoli, turkey and cheese. Cook until hot and bubbly. Pour into dish. Bake 20-28 min until bisquits golden brown. I make lemon Curd from scratch and while it is still warm, I pour it over the Grands with a dab of sour cream on the top. Heavenly! My favorite recipe with Pillsbury Grands is for Monkey Bread. We love them as Kolaches. Rolled out as thin as possible, put approximately 3 pieces thinly sliced ham, and a tablespoon of shredded mozzerella in the middle. Roll and pinch edges, bake as usual. Extras are great microwaved the next day.